Earlier this week, the Premium Bandai blog posted the first images of the upcoming Complete Selection Modification V-Buckle & Drag Visor. Let’s take a look at packaging for this CSM! As we can see, the box for it is pretty big as it does include seventeen Advent Decks (Ridewatch included for size comparison purposes). Also, in the background, you can see the back of Kamen Rider Knight’s helmet. The first thing you’ll notice is that the back of the box is a mirrored version of the front but with Kamen Rider Knight instead of Kamen Rider Ryuki. From this view, we can also see the back of Kamen Rider Ryuki’s helmet. The CSM logo is also reversed. This box is a fair amount smaller than the one that contains the V-Buckle but is no less detailed with an action shot of Kamen Rider Ryuki using the Drag Visor. On the front, we can see Ryuki in the middle, with twelve other Kamen Riders from the series, scattered in the background around him in a sort of shattered mirror effect. On the back of the set box, we can see Kamen Rider Ryuki and Kamen Rider Knight, both in Survive Mode, with their weapons locked. The CSM logo on here is also reversed like on the V-Buckle box. Pre-orders have closed for this set, out in February 2019, but you can take a closer look at what it inside it here. What do you think of the packaging designs for the Kamen Rider Ryuki CSM V-Buckle and Drag Visor set? Are you happy with which Kamen Riders they have included? Let us know in the comments below! 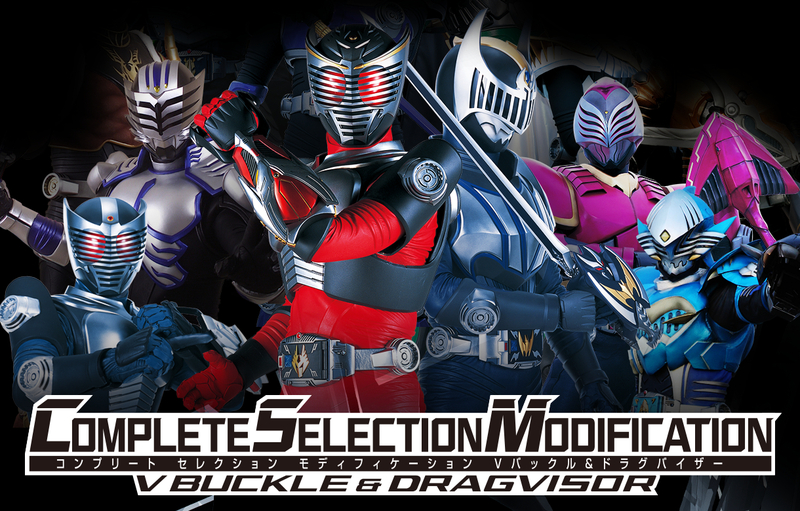 Finally, the Complete Selection Modification belt that Bandai teased a fortnight ago has been announced. Despite a tweet from P-Bandai promising an announcement about a new CSM, fans were left waiting with baited breath for details about a new interloper to their wallets. 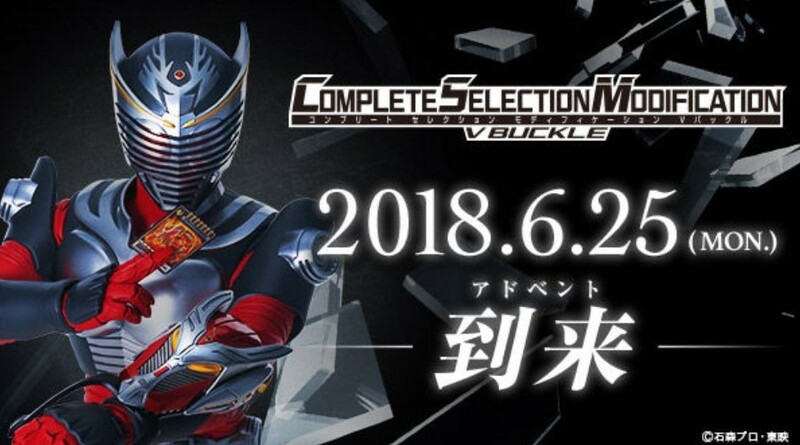 That wait is finally over as, last night, Premium Bandai announced a date of June 25th for a full reveal of their latest Complete Selection Modification release: the V-Buckle from Kamen Rider Ryuki. It’s not yet known what form this release will take. Whether it is just the belt that will be released or whether, similar to the OOO Driver set, we will get a full package of V-Buckle and all of the Advent Decks and Cards will be packaged in a dream Ryuki set. Are you going to pick this set up? Keep those eyes peeled to Toku Toy Store for more details and pre-orders going forward!